Lizzie C. Ballard was born circa 1877 at Kentucky. She was the daughter of Bryant Ballard and Sarah Elizabeth Adams. [S246] U.S. Federal Census 1880 U.S. Federal Census, by Ancestry.com, Family History Library Film 1254415 Page Number 567B. Bessie Lee Ballard was born circa November 1879 at Kentucky. Name Variation Mary Jane Goin was also known as M. Jane. Name Variation Mary Jane Goin was also known as Jane. Married Name 4 July 1945 As of 4 July 1945,her married name was Niemann. Mary Jane Goin was born on 17 June 1924 at Illinois. She was the daughter of Elijia Voltier Goin and Lillie Jane Allen. Mary Jane Goin married Maurice Clifton Niemann, son of Erhart Charles Niemann and Sabra Lee Estes, on 4 July 1945. Mary Jane Goin died on 8 January 2001 at age 76. She was buried after 8 January 2001 at Laughlin Cemetery, Camdenton, Camden, Missouri. Mary Jane Goin obtained US Social Security Card at Illinois; last residence Camdenton, Camden, Missouri. Arthur Hewitt married Ethley M. (?). Arthur Hewitt was born circa 1854 at Canada. [S246] U.S. Federal Census 1880 U.S. Federal Census, by Ancestry.com, NA Film Number T9-1446 Page Number 47C. Married Name Her married name was Hewitt. Ethley M. (?) married Arthur Hewitt. Ethley M. (?) was born circa 1860 at Wisconsin. Married Name Her married name was Koenig. She married Harvey Carl Koenig, son of Emil C. Koenig and Ida L. Zick. Aletha Oleson was born in 1907. She was the daughter of Alvin Julius Oleson and Pearl Clark. Aletha Oleson died in 1989. [S180] Wisconsin Sauk Co Cemetery Records Vol 6, page 93. Name Variation Ruth Idell Whittington was also known as Ruth Idel. Married Name 19 June 1936 As of 19 June 1936,her married name was Bailey. Ruth Idell Whittington was born on 25 November 1914 at Texas. She was the daughter of Cullen Rogers Whittington and Dora M. Canant. Ruth Idell Whittington married Floyd Addison Bailey Sr., son of Charles Addison Bailey and Lora A. Foster, on 19 June 1936 at Texas. Ruth Idell Whittington died on 4 December 2002 at age 88. Ruth Idell Whittington obtained US Social Security Card at Texas; last residence Texas City, Galveston, Texas. Children of Ruth Idell Whittington and Floyd Addison Bailey Sr.
Timothy George Bailey was born on 26 February 1948 at Galveston, Texas. He was the son of Floyd Addison Bailey Sr. and Ruth Idell Whittington. 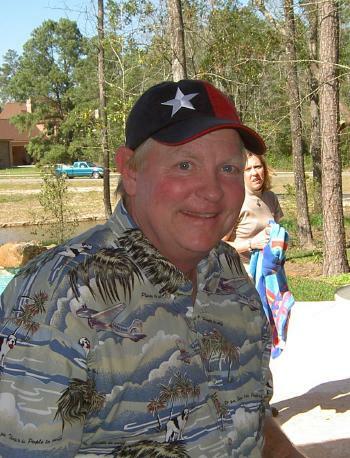 Timothy George Bailey died on 17 September 2009 at age 61 Timothy George Bailey, 61, of Texas City, the greatest man in the world, left us on Thursday September 17, 2009, at his residence. He will be missed by the many that loved him. Funeral services will be held 10 a.m. Tuesday September 22, 2009, at Emken-Linton Funeral Home. Burial will follow at Galveston Memorial Park. Visitation will be 5 p.m. to 7 p.m. Monday September 21, 2009, at the funeral home. Tim was born February 26, 1948, in Texas City. He was an electrician. Tim was a carefree person who was happy-go-lucky and loved life. He enjoyed coaching baseball and coached numerous teams in Texas City for over twenty years. He loved spending time with his family and could always be found wearing a smile and a baseball cap. He is preceded in death by his parents Floyd A. Bailey, Sr. and Ruth Bailey; his brother Mike Bailey; and his sisters Mary Floyd and Ruth Ann Perthuis. Survivors include his wife of forty-one years Jeannette Bailey; son Craig Bailey and wife Jessica; daughter Christy Bailey; brothers Floyd "Red" Bailey and Keith Bailey; sister Judy Howard; grandchildren Preston Bailey, Kennedy Bailey, Tucker Bailey, McKenzie Bailey, Kamdyn Bailey and Bentley Bailey; numerous nieces, nephews, other relatives and friends. Pallbearers will be Floyd Bailey, Jr., Billy Bailey, Tommy Perthuis, Jr., Clarence Broze Jr., James Anderson, Mike Nelson, Herman "Sonny" Hilden and Dan Powers. Emken-Linton Funeral Home. Everett Albert Franke was born on 25 November 1925 at Juneau, Wisconsin. He was the son of Ernest Franke and Gertrude (?). Everett Albert Franke died on 26 August 2000 at age 74. Everett Albert Franke obtained US Social Security Card at Wisconsin; last residence Baraboo, Sauk, Wisconsin. Name Variation Beverly Jean Wevik was also known as Bev. Married Name 5 November 1950 As of 5 November 1950,her married name was Wetrosky. Beverly Jean Wevik was born on 26 March 1930 at South Dakota. She was the daughter of Newton Hilman Wevik and Viola Ethelyn Sommervold. 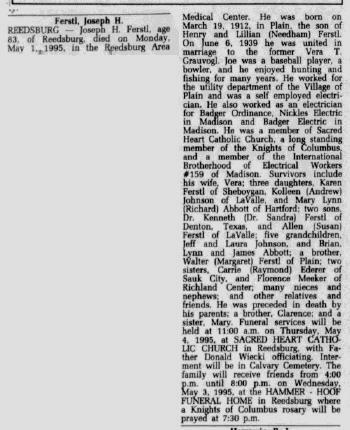 Beverly Jean Wevik married Clinton Lloyd Wetrosky, son of Elmer G. Wetrosky and Ruth Marie Eberhard, on 5 November 1950. Beverly Jean Wevik died on 28 February 2012 at age 81 Beverly Jean (Wevik) Wetrosky was born March 26, 1930 at the family home in rural Beresford, SD to Newton and Viola (Sommervold) Wevik. She passed away peacefully with her family at her side February 28, 2012 at Bethesda of Beresford after a short battle with cancer. She was 81 years, 11 months and two days. Bev graduated from Alcester High School in 1948 and worked at Younkers. She married Clinton Lloyd Wetrosky November 5, 1950 and was blessed with 61 years of marriage. After raising a family, Bev worked at Leland’s Clothing, Truck Towne Café, Conklin’s Cafe and Emily’s. Clint and Bev lived south of Nora until 1966 when they moved south of Roseni in rural Beresford. They retired in 1996 and moved into Beresford. Bev enjoyed playing cards and dominoes with friends. She liked being outdoors and watching roses, her favorite flower, bloom. Bev was always busy embroidering and knitting. She and Clinton took a trip to Hawaii many years ago that held special memories for her. “Baking Day” with her daughters, granddaughters and great-granddaughters was something she always looked forward to; it was a tradition for over 20 years. Helping and serving others was something that brought joy to her. The most important thing in Bev’s life was her family and having everyone together; she cherished every moment she had with them. She was baptized, confirmed, married and a lifetime member of Roseni Lutheran Church. She was Sunday school superintendent for many years, Ladies Aid member and served on many other committees. Bev was a member of the Beresford Senior Citizens where she volunteered serving meals, she volunteered at the Alcester Thrift Shop, delivered Meals on Wheels, was a VFW Auxiliary member and a member of the Nite-n-Gales Extension Club. Her parents, Newton and Viola Wevik; in-laws, Elmer and Ruth Wetrosky and grandson, Tracy Wetrosky preceded her in death. Survivors include her husband, Clinton; children, Nancy (Randy) Schaap, Terry Wetrosky, Pam (Randy) Heuer, Jerry (Marlene) Wetrosky and Kim (Dan) Williams; 14 grandchildren, Aaron (Dana) Schaap, Amanda (Paul) Creviston, Abbie (Matt) Bertsch, Lisa (Craig) Ringling, Geoff Wetrosky, Lynsey (Eric) Andal, Tara (Todd) Shumansky, Sara (Ben) Delay, Josh Homandberg, Rachelle (Matthew) Carlson, Heather (Chris) Hongslo, Jonathan Treiber, Molly McInnis and Emma Williams; 18 great-grandchildren, Eva, Stella and Eli Schaap, Isabella and Sophia Creviston, Connor and Caden Ringling, Shaylen and DeLainey Andal, Jace and Aubrey Shumansky, Josie, Megan and Cooper DeLay, Ella Carlson, Avery, Devin and Skylar Hongslo. Also surviving are her aunt, Lillian Solbue; brother, Eldean (Eleanor) Wevik; foster sister, Arlene (Wendell) Akland; brothers-in-law, Lowell (Norma) Wetrosky and Dwight (Wava) Wetrosky; sisters-in-law, Norma Stene, Irene Fickbohm and Shirley Wetrosky; and many nieces, nephews, relatives and friends. Funeral services will be held at 2PM Saturday, March 3, 2012 at Roseni Lutheran Church, rural Beresford. Visitation with family present will be 4-8PM Friday at Emmanuel Lutheran Church in Beresford with a prayer service at 7PM. In March 2010 Beverly Wetrosky will celebrate her 80th birthday with an open house from 2 to 4 p.m. March 28 at the Senior Citizens Center in Beresford, S.D. The event will be hosted by her children. Cards may be sent to her at 300 S. 11th St., Beresford, S.D. 57004. Name Variation Lillian Needham was also known as Matilda. Name Variation Lillian Needham was also known as Lily. Married Name 6 November 1906 As of 6 November 1906,her married name was Ferstl. Lillian Needham was born on 21 April 1888 at Franklin, Sauk, Wisconsin. She was the daughter of Lorenzo D. Needham and Margaret Voelkel. Lillian Needham married Henry H. Ferstl, son of Johanne B. Ferstl and Barbara Bauer, on 6 November 1906 at Plain, Sauk, Wisconsin. Lillian Needham died on 1 February 1970 at Plain, Sauk, Wisconsin, at age 81. Name Variation Henry H. Ferstl was also known as Henry J.
Henry H. Ferstl was born on 9 February 1883 at Plain, Sauk, Wisconsin. He was the son of Johanne B. Ferstl and Barbara Bauer. Henry H. Ferstl married Lillian Needham, daughter of Lorenzo D. Needham and Margaret Voelkel, on 6 November 1906 at Plain, Sauk, Wisconsin. Henry H. Ferstl died on 11 February 1920 at Plain, Sauk, Wisconsin, at age 37. [S245] U.S. Federal Census 1900 U.S. Federal Census, by Ancestry.com, ED134. Dwelling 98. Clarence Ferstl was born in 1907. He was the son of Henry H. Ferstl and Lillian Needham. Clarence Ferstl died in 1935. Joseph H. Ferstl was born on 19 March 1912 at Plain, Sauk, Wisconsin. Joseph H. Ferstl married Vera T. Grauvogl, daughter of Alois A. Grauvogl and Mary A. Ostermeyer, on 6 June 1939. Joseph H. Ferstl died on 1 May 1995 at Reedsburg, Sauk, Wisconsin, at age 83 Joseph H Ferstl obituary. Joseph H. Ferstl obtained US Social Security Card at Wisconsin; last residence Reedsburg, Sauk, Wisconsin. Name Variation Caroline L. Ferstl was also known as C. L.
Name Variation Caroline L. Ferstl was also known as Carrie. Married Name 1935 As of 1935,her married name was Alt. Married Name 26 November 1938 As of 26 November 1938,her married name was Ederer. Caroline L. Ferstl was born on 17 June 1914 at Wisconsin. She was the daughter of Henry H. Ferstl and Lillian Needham. Caroline L. Ferstl married Clarence Alt, son of John B. Alt and Katherine Ringelstetter, in 1935. Caroline L. Ferstl married Raymond G. Ederer, son of Joseph Ederer and Margareth Paulus, on 26 November 1938. Caroline L. Ferstl died on 26 August 2010 at age 96 Caroline L. "Carrie" Ederer, age 96, died on Thursday, Aug. 26, 2010, at Maplewood of Sauk Prairie. She was born in Plain, on June 17, 1914, the daughter of the late Henry and Lillian (Needham) Ferstl. She was married to Clarence Alt in 1935. He died in 1937. She married Raymond Ederer on Nov. 26, 1938. He preceded her in death on Sept. 24, 1998. Carrie enjoyed gardening and was a volunteer at Maplewood Nursing Home and enjoyed helping and visiting others. She was a member of St. Aloysius Catholic Church and the Altar Sodality. 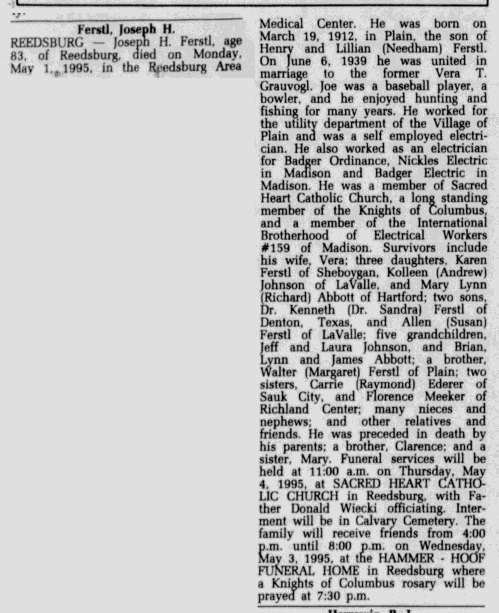 She is survived by three sons, Donald (Marlene) of Loyal, Richard of Sauk City, and Marvin of Clarkdale, Ariz; a sister, Florence Meeker of Richland Center; eight grandchildren, Michael Alt, Beth Alt, Karla Ederer, Donna Ederer, Elena Hurrell, Carol Szews, Mary Schlagenhaft, and Eva Aumann; 13 great-grandchildren; a great-great-grandson; other relatives and friends. In addition to her parents and husbands, she was preceded in death by three brothers, Clarence, Walter and Joseph Ferstl; a sister, infant Mary; and two daughters-in-law, Marilyn and Joan. A Mass of Christian Burial will be held at 11 a.m. on Tuesday, Aug. 31, 2010, at ST. ALOYSIUS CATHOLIC CHURCH, Sauk City, with Father Jared Hood officiating. Burial will follow in St. Aloysius Cemetery. Friends may call from 9:30 a.m. until 10:45 a.m. at HOOVERSON FUNERAL HOME, Sauk City, on Tuesday, August 31, 2010. Hooverson Funeral Home Sauk City (608) 643-6430. Married Name Her married name was Meeker. Florence Ferstl married (?) Meeker. Florence Ferstl was born on 19 January 1918. Florence Ferstl died on 3 May 2012 at age 94 Florence E. Meeker age 94 of Richland Center passed away on Thursday, May 3, 2012 at the Pine Valley Health Care & Rehabilitation Center. She was born on January 19, 1918 in Franklin Township the daughter of Henry and Lillian (Needham) Ferstl. Florence was a member of St. Mary's Catholic Church in Richland Center and loved bowling, dancing and trips to Las Vegas. She was preceded in death by her parents, Henry and Lillian Ferstl, 2 sisters, Mary Ferstl, Caroline Ederer, 3 brothers, Clarence, Joseph and Walter Ferstl. Mary Ferstl was born in 1909. Mary Ferstl died in 1910. Name Variation Johanne B. Ferstl was also known as John. Name Variation Johanne B. Ferstl was also known as Johann. Johanne B. Ferstl married Barbara Bauer. Johanne B. Ferstl was born in February 1847 at Bavaria, Germany. Johanne B. Ferstl and Barbara Bauer immigrated in 1872. [S246] U.S. Federal Census 1880 U.S. Federal Census, by Ancestry.com, NA Film Number T9-1446 Page Number 102D. Married Name Her married name was Ferstl. Barbara Bauer married Johanne B. Ferstl. Barbara Bauer was born in August 1842 at Bavaria, Germany. Barbara Bauer and Johanne B. Ferstl immigrated in 1872. Barbara Bauer had 5 with 5 living in 1900 children. Name Variation Lorenzo D. Needham was also known as Hutter. Lorenzo D. Needham was born on 18 October 1857 at Prarie Du Sac, Wisconsin. He was the son of Lorenzo Bow Needham and Caroline W. Engel. Lorenzo D. Needham was listed as a beneficiary in Lorenzo Bow Needham's will on 14 March 1863 at Sauk, Wisconsin. Lorenzo D. Needham married Margaret Voelkel, daughter of Jodakus Voelkel and Maria Eva Reuschlein, on 25 April 1878 at Plain, Sauk, Wisconsin. Lorenzo D. Needham died on 22 September 1936 at Plain, Sauk, Wisconsin, at age 78. [S246] U.S. Federal Census 1880 U.S. Federal Census, by Ancestry.com, NA Film Number T9-1446 Page Number 105A. [S244] U.S. Federal Census 1910 U.S. Federal Census, by Ancestry.com, ED115. Dwelling 113. Married Name 25 April 1878 As of 25 April 1878,her married name was Needham. Margaret Voelkel was born on 7 July 1857 at Franklin, Sauk, Wisconsin. She was the daughter of Jodakus Voelkel and Maria Eva Reuschlein. Margaret Voelkel married Lorenzo D. Needham, son of Lorenzo Bow Needham and Caroline W. Engel, on 25 April 1878 at Plain, Sauk, Wisconsin. Margaret Voelkel died on 16 March 1946 at age 88. Margaret Voelkel had 9 with 9 living in 1910 children. [S248] U.S. Federal Census 1860 U.S. Federal Census, by Ancestry.com, Dwelling 1166. [S247] U.S. Federal Census 1870 U.S. Federal Census, by Ancestry.com, Dwelling 61. Theresia Ferstl was born circa 1874 at New York. She was the daughter of Johanne B. Ferstl and Barbara Bauer. Barbara Ferstl was born in February 1876 at Wisconsin. Name Variation Margaret Ferstl was also known as Maggie. Margaret Ferstl was born in August 1877 at Wisconsin. Joseph Ferstl was born in September 1881 at Wisconsin. Name Variation Joseph Edward Needham was also known as Joseph H.
Joseph Edward Needham was born on 21 March 1879 at Wisconsin. He was the son of Lorenzo D. Needham and Margaret Voelkel. Joseph Edward Needham married Elizabeth M. Bindl, daughter of Michael Bindl and Emilia Weishahn, circa 1903. Joseph Edward Needham died in 1950. Married Name 8 October 1939 As of 8 October 1939,her married name was Jamtgaard. Arlene Younie was born on 21 December 1920. She married Orval G. Jamtgaard, son of Peter J. Jamtgaard and Inga Stene, on 8 October 1939. Arlene Younie died on 21 January 2002 at age 81. Arlene Younie obtained US Social Security Card at Iowa; last residence Nora Springs, Floyd, Iowa. Name Variation Gustave Meir Johnson was also known as Gus. Name Variation Gustave Meir Johnson was also known as Gustav. Gustave Meir Johnson was born in July 1870 at Dakota Territory. He married Sophia Margaret Jamtgaard, daughter of Johan Olsen Jamtgaard and Olava Quall, circa 1899 at Sioux City, Woodbury, Iowa. Gustave Meir Johnson died after April 1930. [S245] U.S. Federal Census 1900 U.S. Federal Census, by Ancestry.com, ED337. Dwelling 218. [S244] U.S. Federal Census 1910 U.S. Federal Census, by Ancestry.com, ED127. Dwelling 125. [S243] U.S. Federal Census 1920 U.S. Federal Census, by Ancestry.com, ED83. Dwelling 25. [S250] U.S. Federal Census 1930 U.S. Federal Census, by Ancestry.com, ED21. Dwelling 130. John W. Goetschius married Cerina (?). John W. Goetschius was born in 1851 at Ohio. Married Name Her married name was Goetschius. Cerina (?) married John W. Goetschius. Cerina (?) was born circa 1860 at Illinois.